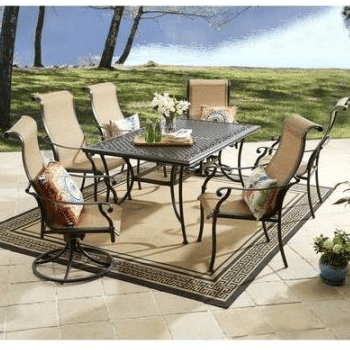 If you have a larger patio or deck area, over 10 foot square, this Better Homes and Gardens Southgate Drive aluminum patio dining set from Walmart.com will work well in most outdoor decors. With six sling type chairs, two of them swivel rockers, four of them straight leg and a large dining table for large diner parties in your outdoor space. With most sets in this size being over $1000, this set is very inexpensive for the quality. The powder coated finish and sling fabric will last very well in any outdoor environment with little care, you will not have to worry about storing cushions. Now lets look at the details of this set and see if it will work for your outdoor dining room. If you would like to see current pricing and availability use this like below. You will get two large boxes when this set arrives, one for the table and one for the chairs. The table box is 71 inches long, 41 inches wide and 3.5 inches thick, it will weigh 77 pounds. The chair box is 48.5 inches long, 25.75 inches wide and 39.75 inches high, it will weigh a hefty 125 pounds. You will need a pickup or large SUV to pick this up at the store, also bring a big friend for helping move these big heavy boxes. The table is 67.75 inches long, 38 inches wide and 28.5 inches tall. 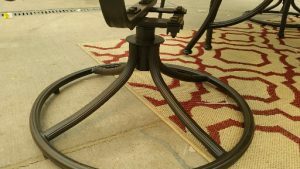 It has a cast aluminum top with steel legs and center support. 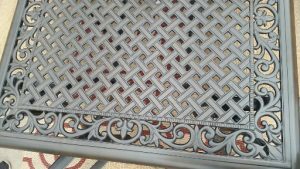 The metal parts are powder coated for durability in the outdoor environment.The lattice top is bordered with a scroll design for a rich look, see picture to the right. There is a 1 1/2 inch hole in the center of the table for an umbrella, not included in this set. If you do not use one a plastic cover is included in this set. The center support also has a built in support for an umbrella, see my post here for some umbrella ideas. The chairs will come in two designs, you will receive two swivel rockers and four straight leg chairs. 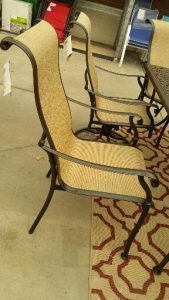 The sling chairs have a PVC and polyester material for the seating portions, I have similar chairs on my front porch they are very comfortable for long term sitting. The frames are powder coated steel material. Each chair will support 250 pounds. Add a rug to define the space of your room, see some of my examples here. Assembly of the table is easy if you have a second set of hands. Put top upside down, attach four legs and then add center support. Have sitting on legs on a level surface for final tightening to insure a level table when finished. The two swivel chairs will take a little more work than the straight leg chairs. Attach the swivel bracket to the seat base, then attach the sling fabric with frame to the seat base. Each chair seat base will have a support bar that has to be rotated 90 degrees for fabric support after the fabric has been installed. Insert the swivel bracket in the floor base of the chair and you are ready for sitting. The straight leg chairs will require just the sling frame to be attached to the chair frame. You will also have to rotate the support bar 90 degrees to ensure the support of the sling fabric when sitting on chair. 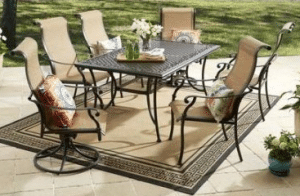 You will need a larger outdoor area for this aluminum patio dining set set. Having the aluminum top for the table and the sling chairs, this set will last many years without a lot of care. Get an umbrella for shade and you will have all the comfort of eating a meal outdoors like a high priced cafe or restaurant. I have both type of sling chairs in my outdoor space and they are very comfortable for long term sitting. 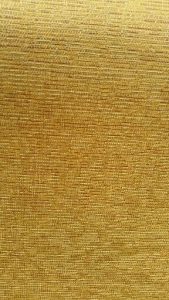 The sling fabric will take little care and is made from recycled material. If you found this information helpful, share on your social networks with your friends. If you have any questions or comments, please use the forms below and I will get back to you. There are some affiliate links in this article, if you use one I could make a small commission. Hey John, nice informative article, plain and simple explanation, this market is very competitive and the set reviewed seems to be well priced as opposed to similar competing brands, thank you for an informative post. Keeping my followers informed will be what this website is about. This set is for a larger area, and is priced at a very good price at this time. It is a great idea to have a dining set outside . When I used to stay in the country and had tons of space outside we alway used to play board games outside with family and friends. I would probably need more than one set because of all the attention the games received. I think this is what I need to spice up my events. Thanks for the info. This is a large set and would be great for diner parties and game nights outside. We have game night every Friday night, we only have a few people not enough for this big set.